The domain within your query sequence starts at position 3441 and ends at position 3478; the E-value for the Beach domain shown below is 9e-13. 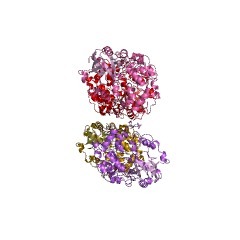 The BEACH domain was described in the BEIGE protein (D1035670) and in the highly homologous CHS protein. The BEACH domain is usually followed by a series of WD repeats. The function of the BEACH domain is unknown. BEACH (Beige and Chediak-Higashi) domains, implicated in membrane trafficking, are present in a family of proteins conserved throughout eukaryotes. 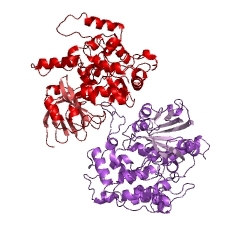 This group contains human lysosomal trafficking regulator (LYST), LPS-responsive and beige-like anchor (LRBA) and neurobeachin. Disruption of LYST leads to Chediak-Higashi syndrome, characterized by severe immunodeficiency, albinism, poor blood coagulation and neurologic problems. Neurobeachin is a candidate gene linked to autism. LBRA seems to be upregulated in several cancer types. It has been shown that the BEACH domain itself is important for the function of these proteins [(PUBMED:17079274), (PUBMED:15086784), (PUBMED:12125812), (PUBMED:15342963), (PUBMED:15193433), (PUBMED:11102458), (PUBMED:12535270), (PUBMED:12210762)]. The BEACH domain is usually followed by a series of WD repeats. There are 8132 Beach domains in 8120 proteins in SMART's nrdb database. Taxonomic distribution of proteins containing Beach domain. This tree includes only several representative species. The complete taxonomic breakdown of all proteins with Beach domain is also avaliable. Click on the protein counts, or double click on taxonomic names to display all proteins containing Beach domain in the selected taxonomic class.